Top it off with a big scoop of vanilla ice cream! Nutritional data does not include ice cream. 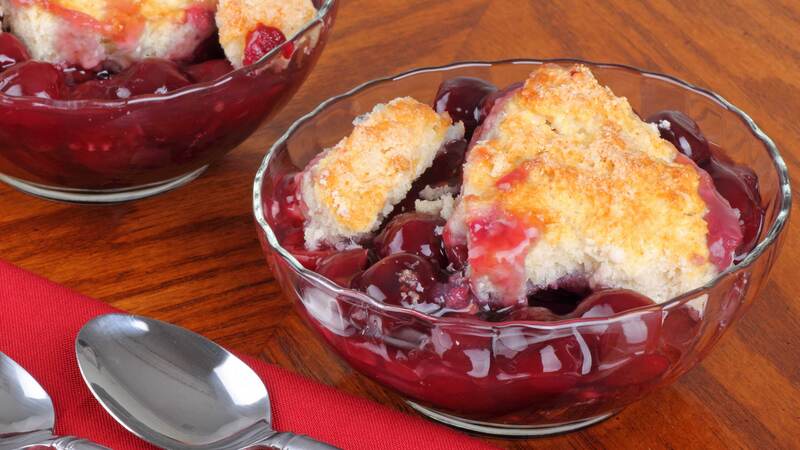 Combine cherry filling and almond extract in an ungreased 8x8x2-inch baking pan. Combine flour, sugar and baking powder in a medium mixing bowl; mix well. Add orange juice, stirring just until dry ingredients are moistened. Drop batter by tablespoonfuls over cherry fililng, making at least 8 dumplings. For the topping: Combine almonds, sugar, orange peel and cinnmaon in a small bowl; mix well. Sprinkle on top of cobbler. Bake in a preheated 350 F. oven 30 to 35 minutes, or until filling is bubbly and dumplings are brown.